With the value of venture capital transactions in Europe reaching a record high in 2017, we examine the impact of this on the exit and fundraising environments as well as investor interest in the region. While North America has historically dominated the venture capital industry, and despite Asia accounting for the greatest proportion of growth capital secured over the years, Europe’s overall shares of venture and growth capital have increased recently in line with investors’ growing interest in the region. We examine the activity of established firms within these markets, as well as the boosted economies and the unprecedented rise of the European technology industry. 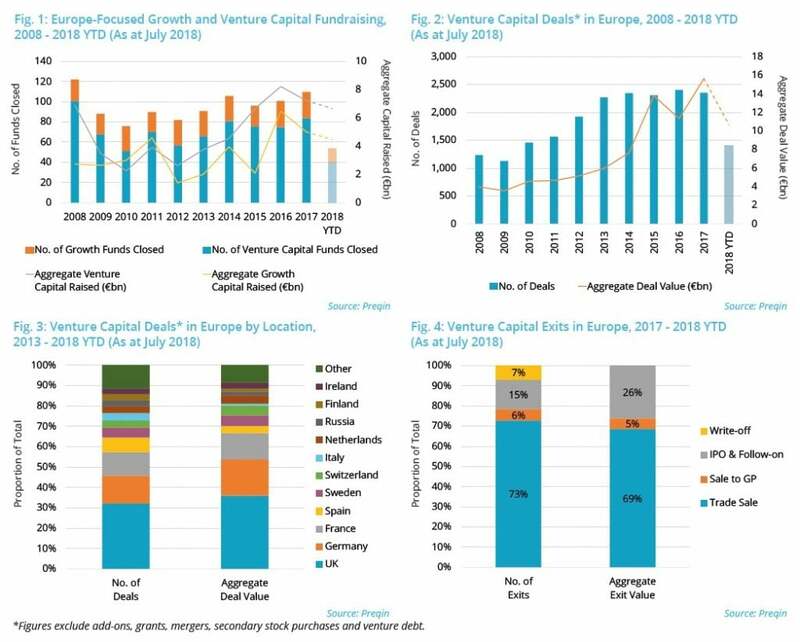 In 2008-2015, Europe-focused venture capital and growth funds collectively failed to raise more than €10bn in any year; however, 2017 marked the second consecutive year in which this figure had been surpassed, and 2018 has already reached totals upwards of €11bn as at July (Fig. 1). The largest fund closed so far this year is Inflexion Partnership Capital II; managed by London-based Inflexion Private Equity Partners, the growth vehicle exceeded its £700mn target to close on £1.0bn in May 2018, securing commitments from prominent investors such as New York State Teachers’ Retirement System and Illinois Municipal Retirement Fund. With increasing uncertainty over the future relationship between the UK and EU, it is encouraging to see sustained investor appetite in the region. Over the years, venture capital investment activity in Europe has increased, and twice as many transactions were completed in 2016 than in 2009. Last year, there were 2,354 venture capital deals in Europe for a record €16bn (Fig. 2). This healthy deal flow has continued into 2018, with the total value of deals already exceeding €10bn for the fourth consecutive year. Almost a third (32%) of Europe-based venture capital deals since 2013 were located in the UK, accounting for 36% of aggregate deal value; Germany accounts for 14% of deals and 18% of aggregate deal value (Fig. 3). 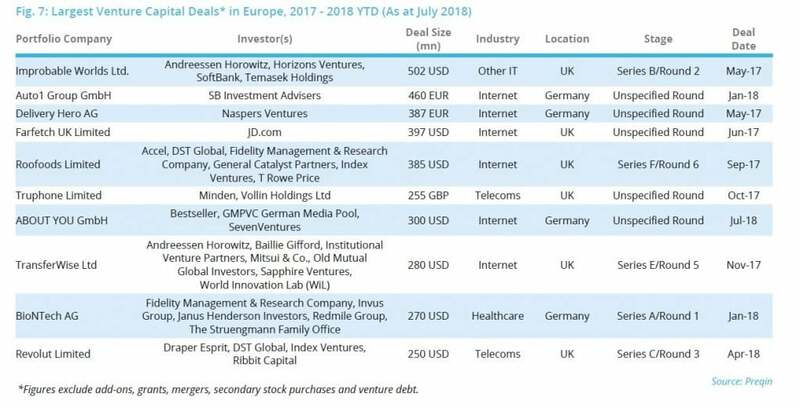 Notably, the 10 largest European venture capital deals since 2017 all took place in either country (Fig. 7). The largest deal in the UK involved Improbable Worlds Ltd., a London-based start-up that provides a computer simulation platform. SoftBank, a new investor, led a $502mn Series B fundraise; Temasek Holdings, Horizons Ventures and Andreessen Horowitz also participated in the transaction. The largest transaction in Germany involved Auto1 Group GmbH, a Berlin-based online marketplace for automobile dealership networks; in January 2018, the company raised €460mn from SB Investment Advisers through SoftBank Vision Fund. As aggregate venture capital deal value has remained strong in Europe in recent years, so too has the aggregate exit value: this figure in 2013 was more than twice as high as 2012, and has remained steady since then – although the number of venture capital exits in Europe has seen a year-on-year fall since 2015. While there have only been 95 venture capital exits so far in 2018, these transactions amount to €11bn, the second highest amount in the past decade. Furthermore, the average exit value (€404mn) in 2018 is a record amount, significantly higher than the 2008-2017 average (€105mn). The fall in the number of exits and the rise in exit value illustrates a challenging environment reflective of rising asset valuations, which may potentially impact a fund’s performance. The largest exit of a Europe-based portfolio company since 2017 was the $7.4bn IPO of Spotify AB, a cloud-based music streaming service (Fig. 8). Only 15% of exits and 26% of aggregate exit value since 2017 were IPOs, whereas trade sales represented 73% of exits and 69% of aggregate exit value over the same period. Twenty percent of investors surveyed by Preqin at the start H2 2018 expect to commit more capital to venture capital fundsin the next 12 months than the previous year, and a further 66% plan to commit the same amount. Around a quarter of private equity investors believe that venture capital and growth funds present the best opportunities (25% and 21% respectively), behind small to midmarket buyout funds (44%, Fig. 5). Among all investors surveyed, 36% view Europe as the most attractive region for investment in the next 12 months (Fig. 6). It is clear that fund managers have noticed the increase in investor interest throughout Europe and are reacting accordingly, despite the region being in a period of uncertainty: 269 Europe-focused venture capital and growth funds are currently on the road, targeting an aggregate €32bn in capital. The largest of these vehicles is FSI Mid-Market Growth Equity Fund (Fig. 9); launched in 2017 by FSI, the fund is targeting €2.0bn for investments in Italy-based companies with prospects for growth, transformation and consolidation in international markets. The fund held a third close in June 2018, securing €1.3bn. The US venture capital industry is viewed as the most developed market, exerting greater influence than Europe – Silicon Valley alone has received billions of dollars over the past couple of decades. While Asia has historically accounted for a greater proportion of institutional commitments in the growth capital industry, the European market is becoming more important as many investors look to develop more mature companies with proven business models. Europe-based venture and growth capital firms have gained a wealth of experience in recent times and have established strong track records. 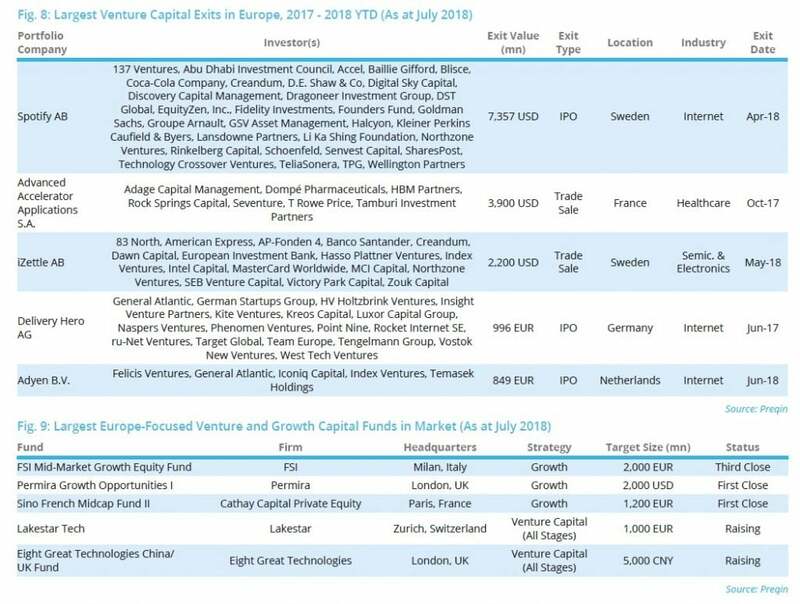 While there is growing uncertainty in the investor and fund manager community over the impact of Brexit on investments in Europe, more capital continues to be secured by venture capital firms for such investments. With deal flow in the region remaining at a similar level in recent years, growth in the industry looks set to continue. 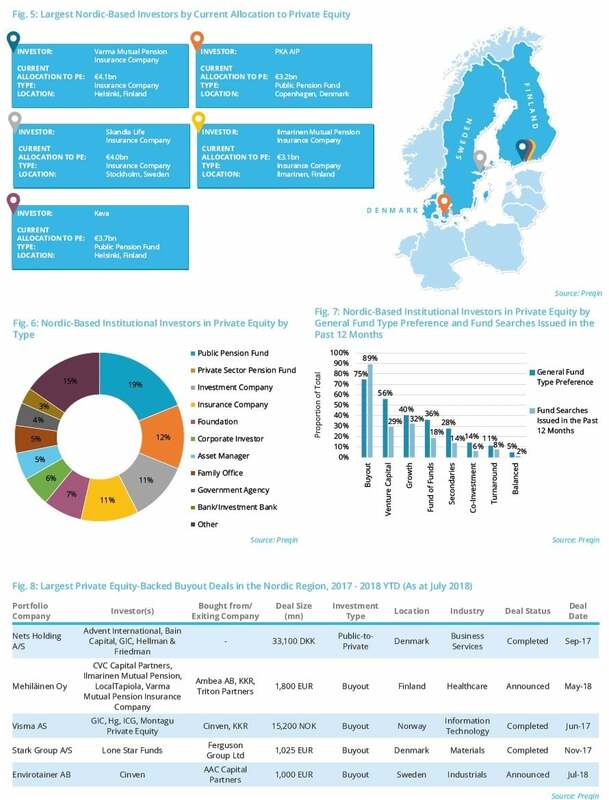 This month’s Industry News provides a snapshot view of Nordic-based private equity funds that have closed since the start of 2017, private equity-backed buyout deals in the Nordic region and public pension funds’ investment plans in private equity. 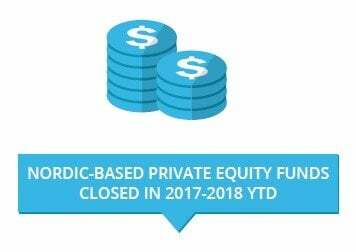 Forty Nordic-based private equity funds have reached a final close since the start of 2017 (as at July), securing an aggregate €19bn. The largest fund closed in this period was EQT VIII; managed by Stockholm-based EQT, the buyout vehicle held a final close in September 2017 on €10.75bn, 54% above its €7.0bn target. EQT also closed the second largest fund in this period, EQT Mid Market Europe, which focuses on control or co-control investments in mid-market companies in Europe (including the Nordic, DACH and Benelux regions) with an enterprise value of €100-300mn. The buyout vehicle held a final close on €1.6bn in May 2017. 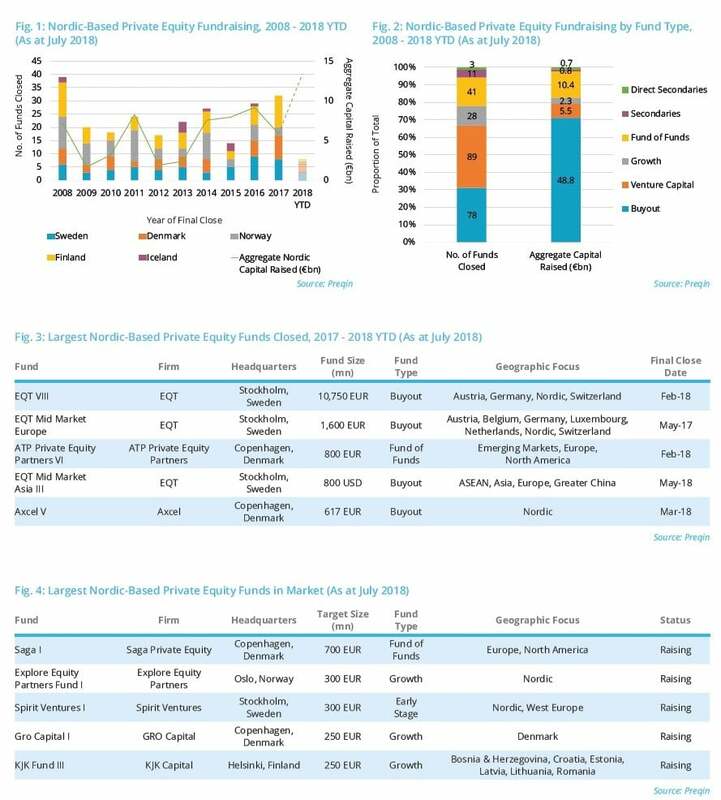 Two Denmark-based private equity funds were among the largest five Nordicbased funds to close in this period. This includes ATP Private Equity Partners VI, managed by Copenhagen-based ATP Private Equity Partners, which will invest in buyout, venture capital, distressed debt and secondaries funds focused on North America and Europe, with a potential allocation to emerging markets. The fund held a final close on €800mn in February 2018. 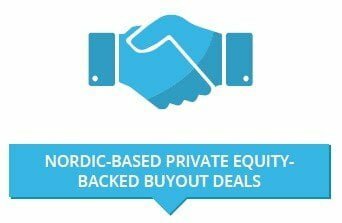 Since the start of 2017, there have been 302 private equity-backed buyout transactions in the Nordic region for an aggregate deal value of €16bn. The largest deal involved Nets Holding A/S, a Denmark-based company that provides strategic consulting and customized end-to-end IT solutions. In September 2017, Nets Holding A/S agreed to be acquired by a consortium of investors led by Hellman & Friedman with participation from Advent International, Bain Capital and GIC. Bain Capital and Advent International are re-investing in the deal and will both maintain a 16% stake in the company. The transaction was completed in February 2018. In May 2018, a consortium led by CVC Capital Partners, through CVC Capital Partners Fund VII, with participation from Ilmarinen Mutual Pension Insurance Company, LocalTapiola, Varma Mutual Pension Insurance Company acquired Mehiläinen Oy for €1.8bn. As at July 2018, there are 103 public pension funds actively searching for investments in private equity funds worldwide. Among this group is Merced County Employees’ Retirement Association, which expects to invest $10-30mn across 3-6 funds in the next 12 months. The California-based institution will target mostly buyout, growth and mezzanine vehicles with a global reach using a mixture of new and existing managers in its portfolio. Also seeking new investment opportunities in the next 12 months is Italy-based Fondo Pensione Laborfonds, which plans to invest in global buyout funds on an opportunistic basis. 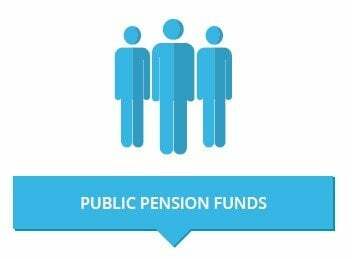 South Korea-based Korea Teachers’ Pension Fund will look to invest KRW 33-110bn ($30-100mn) across 2-3 private equity funds in the next 12 months. The institution will look to invest in mezzanine and secondaries vehicles focused on North America and Europe, and will use a mixture of new and existing managers in its portfolio. Private equity capital raised by managers based in the Nordic region – comprising Denmark, Finland, Greenland, Iceland, Norway and Sweden – has reached a record high so far in 2018. We take a closer look at the recent fundraising activity and market trends in this region. 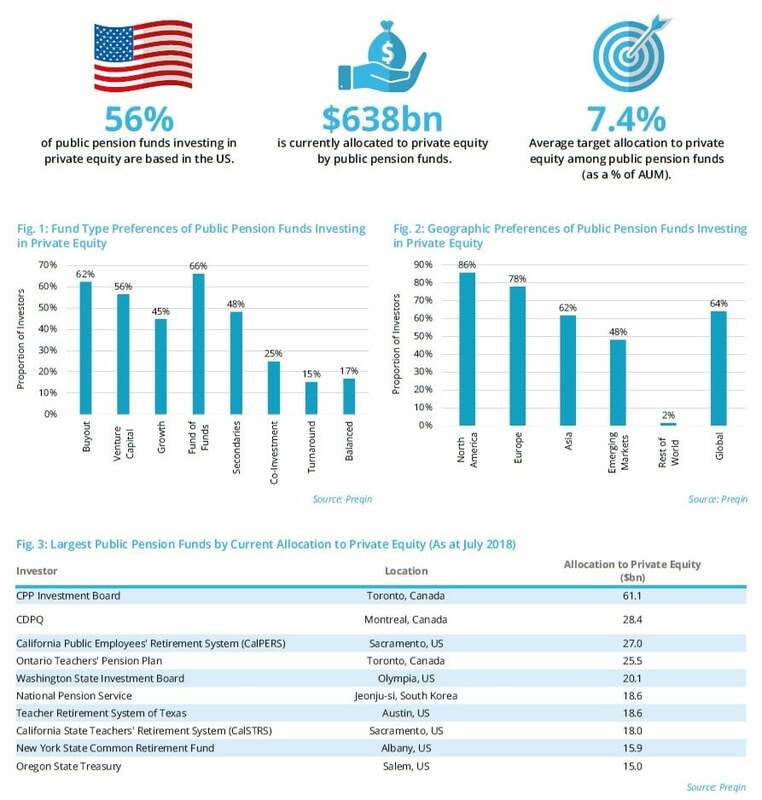 We summarize public pension funds’ activity in private equity by strategy and geographic preference, as well as the largest firms by current allocation to the asset class.